1 of 4 In a small saucepan, combine sugar and 1/2 cup water. Bring to a simmer and stir until sugar is dissolved. Cool and stir in lemon juice. 2 of 4 Stir 1/4 cup sugar syrup into yogurt. Mix 8 drops of blue food coloring and raspberry extract, if using, into 1/2 cup yogurt mixture. 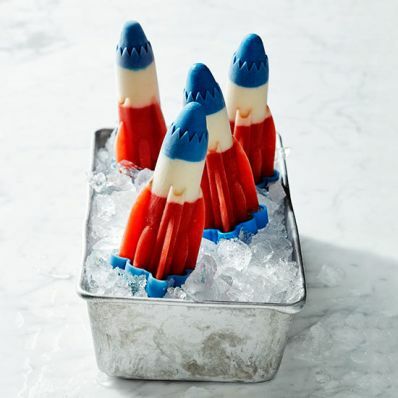 Spoon about 2 tsp blue yogurt mixture into each rocket pop mold and freeze for 1 hour. Spoon remaining yogurt mixture into molds (about 3 tsp each) and freeze for 1 hour. 3 of 4 Place watermelon in a food processor and add 3/4 cup sugar syrup. Process until smooth. Spoon about 3 tbsp watermelon mixture into each mold. Insert handles into molds and freeze overnight. 4 of 4 To serve, run under warm water and slide each pop out of its mold.